Book a whale-watching boat tour to encounter the whales up close. Boats leave from Noyo Harbor in Fort Bragg. Call the Chamber for referrals at 707-961-6300. 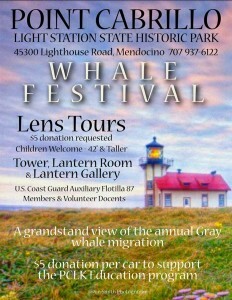 A spectacular opportunity for family fun awaits visitors during Whale Festival on the first and third weekends of March at the Light Station from 10 am to 4 pm each day. In addition to a grandstand view of the annual gray whale migration, you may visit the 240 gallon saltwater aquarium and our Marine Science Exhibit. The 1st Assistant Lightkeeper’s House is also open. This period museum shows how lightkeepers and their families lived in the 1930s. Point Cabrillo Lightkeepers Association (PCLK) volunteer docents will highlight Light Station history and local culture with visitor presentations at the Lighthouse and other locations in the State Historic Park. Weather permitting, docents will also lead walks to nearby Frolic Cove and relate the story of the clipper brig Frolic, wrecked off the cove in July 1850 bound from China to San Francisco with a valuable cargo of Chinese merchandise for the Gold Rush miners and their families. During Whale Festival, we request a $5.00 parking donation. The money raised goes toward our education fund, which supports school field trips to the Light Station. To learn more about the gray whale migration, click here. 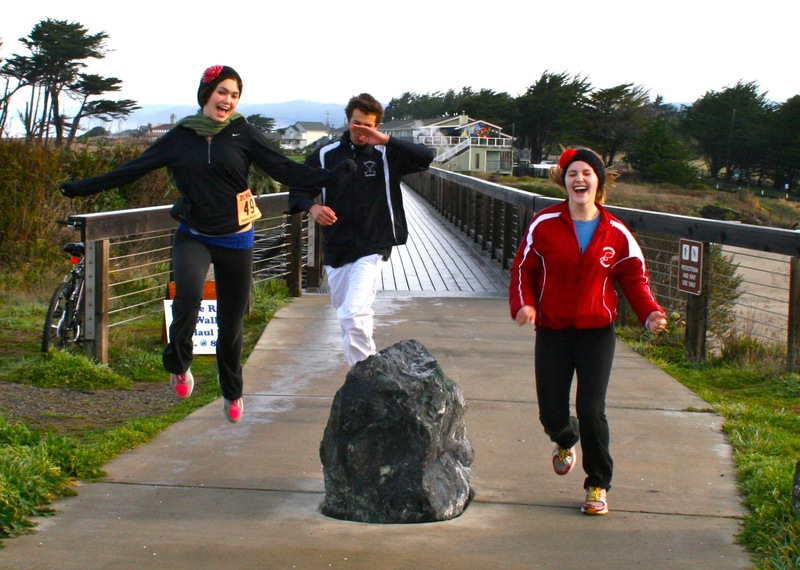 Soroptimist international of Fort Bragg will be holding their 35th Annual Whale Run and Walk on March 16 starting at 8:30am. For more information and to register visit www.soroptimistfortbraggca.org. Fort Bragg Rotary Club is holding their 24th Annual Beer Festival on March 16th from 12-4pm. Will be at the historic Eagles Hall (210 N. Corry St.). Tickets are $30. Come and enjoy the live music and BBQ. Big River Beach in Mendocino, on the river side. Location: Downtown Center at 338 N. Main St. Location: Crow’s Nest Interpretive Center. Enter from West Cypress St. and follow the signs. 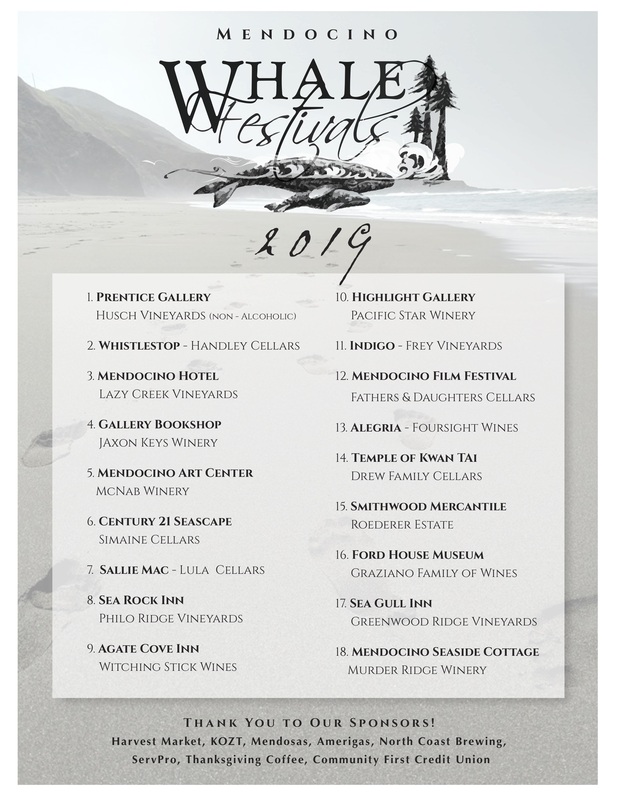 Date: March 17th, Wine Tasting from 1:00pm -4:00pm, Activities 11:00am to 4:00pm. Located three miles North of Fort Bragg on Highway 1, is an ideal location for watching the gray whale migration. The park has a wheelchair accessible boardwalk allowing access to the headlands of Laguna Point with stunning views of the coastline. Day use is free. 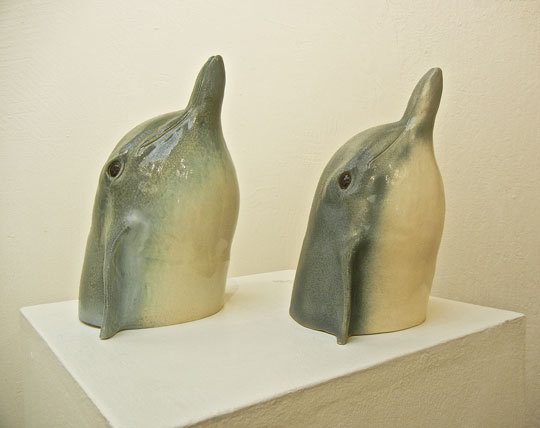 The 2018 Whale Festival is a ‘must attend’ event on March 15th, 16th and 17th. Events and admission to the park are free and all ages are welcome. Events are listed below. For additional information or questions contact (707)961-0471 or visit www.mendoparks.org. Friday, March 15th, 7:00 p.m. Lecture to take place in the Veterans’ Memorial Building located at 360 North Harrison St., in Fort Bragg. Join State Parks for an exciting lecture given by a guest speaker about the whales of the Pacific. Refreshments, interactive activities and a raffle to take place at the time of the lecture. Event to take place rain or shine. Saturday, March 16th, beginning at 11a.m. Docents and State Parks’ staff lead informative guided whale walks. The program will start at the Visitor Center and whale skeleton for discussion before driving to Laguna Point for whale watching. Binoculars are available. Events to take place rain or shine. Dress appropriately. Saturday, March 16th: 1 to 4 p.m.
Family event includes arts and crafts, games and educational activities. Learn all about the whales of the Pacific in this interactive learning event. Visit our education stations to learn more about whales. Play games, make art, listen to music and enjoy a free hot dog lunch (donations accepted). Event to take place at the MacKerricher campfire center, rain or shine. Dress appropriately. 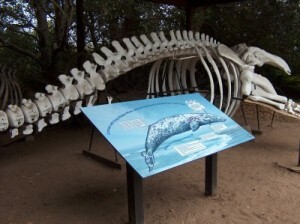 Sunday, March 17th, 1 to 3 p.m. Help preserve our whale skeleton. Come to MacKerricher State Park Visitor Center to help paint and preserve our whale skeleton. Every year a fresh coat of paint is applied to our famous gray whale skeleton to help protect it from the elements. Bring a paint brush and wear your painting clothes. Built in 1854 for Jerome Ford, the acknowledged founder of Mendocino, the Ford House has exhibits highlighting the area’s natural and cultural history, including a scale model of Mendocino as it was in 1890. For additional information, visit the Ford House online at http://mendoparks.org , on Facebook, or by calling the Ford House Visitor Center at (707) 937-5397. "Whale Tales" - Exhibit at the Ford House Visitor's Center, featuring bones from a Gray Whale, information regarding the gray whale migration, and an interactive exhibit that lets you quiz yourself on whale facts. Thought the month of March. Knowledgeable docents will be on hand at the Ford House throughout the Whale Festival with tips on when and where to watch for whales, and to answer questions regarding gray whale natural history. 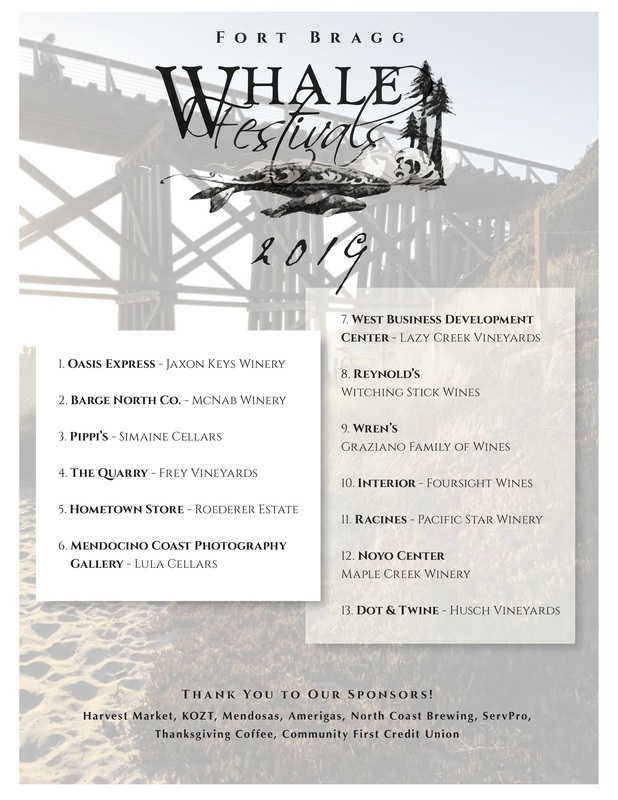 Docent-led whale watch walks - Walks are scheduled during the Mendocino Whale Festival at 11 a.m. and 2 p.m. on Saturday, March 2nd, and 11 a.m. on Sunday, March 4th. A limited number of binoculars and spotting scopes are available. Meet at the Ford House. Thanksgiving Coffee will be providing free coffee tasting - Try some Thanksgiving Coffee at the Ford House during the Mendocino Whale Festival, Saturday only, March 2nd, 12 p.m. to 4p.m. The visitor center will be opening at 9:30 a.m.